"The only reason to see this is to make sure Steve Martin makes enough money to NEVER TRY SOMETHING LIKE THIS AGAIN." It's back! Da-dumbest re-make idea since The Dukes of Hazzard. The Peter Sellers classic has been re-incarnated with Steve Martin in the role of bumbling French detective, Inspector Clouseau. Oh, where to start? If you've never seen the originals, there are some memorably funny moments scattered through the five (or so) Blake Edwards films. The films revolve around the unusual slapstick talents of Peter Sellers. There's something unique about his character...arrogant, yet innocent, awkward, yet graceful. He took low-brow humor to a different place than others have gone. Herbert Lom appeared as Chief Inspector Dreyfus in many of those films, and his fist-pounding frustration was classic -- Yosemite Sam would have been proud. And let's not forget Burt Kwouk's Cato, in the cat-and-mouse kung fu attacks peppered throughout the films. So, Steve Martin decides to make a new Pink Panther. Why, you might ask? 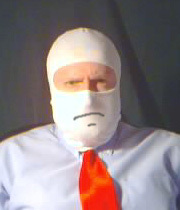 The Masked Reviewer has no idea. Leave well enough alone! In 1968, Alan Arkin tried to make a movie based on the character, called (not coincidentally) Inspector Clouseau. It wasn't good. Have you seen A Shot in the Dark? Possibly the best of the Pink Panther films. If you see that, even though it's FORTY years old, you'll feel sad seeing the Steve Martin version. It's not that Steve Martin is bad. He's done funny work. But, he never makes the role his own. How can anyone? Peter Sellers defined the role, and anyone doing a bumbling, arrogant, hard-to-understand French detective will always be in Sellers'ss's shadow. The Masked Reviewer isn't a big fan of unnecessary government regulations, but isn't it time that congress passed a law making re-makes of good movies illegal? Or, at least make them subject to popular vote. There are a couple of funny moments in the new Pink Panther. This includes a fart joke and a completely random object exploding. The rest of the gags fall flat. The casting of Kevin Kline as Dreyfus doesn't add anything. He's also doing a pale imitation. And, his accent seems to change throughout the film. The only "new" character is played by Jean Reno (who is the only one with a real goofy French accent), who is a combination of Kato and straight-man for Steve Martin. There's really not all that much to say. You can watch it and imagine how every scene would be better with Peter Sellers. Physical comedy isn't Steve Martin's forte. There are moments in the script that have humor along the lines of The Jerk, which would have been a better direction to follow. On top of it all, the Steve Martin Clouseau doesn't stay true to the character...he winds up really being a super-sleuth, which doesn't make sense in the context of the rest of the film. Many parts of the film are embarrassing to watch. There will be people who will enjoy every frame and leave the theater convinced that Steve Martin just gave his best performance. Those people need help. There's no reason to sit through this film, despite the fact that there haven't been any appealing theatrical releases in weeks. This might be a good time to rent. Hollywood wonders why the box office numbers are going down. HELLO? Stop making crap. The Masked Reviewer thinks the studio would have been better off re-releasing A Shot in the Dark in theaters. If you love, love, love Steve Martin, and you've never seen any Peter Sellers films, and you think Steve Martin jumping around doing karate chops sounds great, you might like this film. Otherwise, stay home. The only reason to see this is to make sure Steve Martin makes enough money to NEVER TRY SOMETHING LIKE THIS AGAIN. But, it'll probably do well enough for another bad re-make. Expectation from the Title: A funny Peter Sellers film...PSYCHE! Mother's Rule (Always Say Something Good About Everything): Beyonce looks great, which is good, considering she didn't have anything else to do in the film. The Pros: Hmmm...it reminds you of the funniest moments in the Peter Sellers films. The Cons: It isn't funny. It's sad and embarrassing. Wasted talents. Lame. It makes you depressed about the state of filmmaking these days.